Conrad Hotels & Resorts, Hilton’s smart luxury hotel brand, is delighted to welcome guests to the new Conrad Guangzhou, the seventh Conrad property to debut in China. Created as a stylish urban oasis in the heart of CBD Zhujiang New Town, Conrad Guangzhou boasts panoramic river views from its rooms and restaurants while offering intuitive amenities and flawless service. The hotel is ideal for leisure and business travelers alike who want to explore, do business and stay inspired. Conrad Guangzhou offers 309 spacious guest rooms and suites in a modern 27-story tower overlooking the Pearl River. The hotel enjoys a prime location in the midst of a new, multi-use complex, where guests can easily walk to premium shopping, entertainment and public art, or attend to business at the nearby corporate offices. Popular landmarks like the Guangdong Museum, Guangzhou Opera House and Canton Tower are minutes away, as are the subway system and bus stations. Conrad Guangzhou features a variety of modern and spacious rooms and suites with panoramic river views and best-in-class amenities. Starting at a generous 48 square meters, rooms feature walk-in closets, large flat screen TVs, WiFi and wired internet access, Nespresso coffee machine, and a shoe dryer, a thoughtful amenity unique to Conrad Guangzhou to keep your shoes warm and dry. Guest may choose from three signature restaurants along with a lounge and bar, designed by the famed Andre Fu and internationally acclaimed design firm, AB concept. World renowned for his design aesthetic that reinterprets traditional ideas with unique and playful presentation, Fu has created three distinct culinary experiences. At Yun Pavilion, celebrated Chef Tan presents his innovative take on traditional Cantonese served in the contemporary dining area or private dining rooms. Sense is Conrad Guangzhou’s all-day restaurant, offering a menu of international favorites served buffet style. Aroma, open for lunch and dinner features a seasonally-inspired menu and Mediterranean dishes. Connect with happy hour cocktails or afternoon tea at Gem, the stylish ground-floor lounge adjacent to the art park. After dark, gather at Mg, Conrad Guangzhou’s chic destination bar offering a range of drinks and light bites. Conrad Guangzhou guests can stay healthy, fit and inspired while traveling with a stunning fitness center located on the sixth floor with state-of-the-art equipment, a 25-meter indoor pool and sweeping views of the city. The onsite Spa offers relaxing and rejuvenating treatments. Ideal proximity, convenience and unique services make Conrad Guangzhou the preferred choice for business travelers and conferences as well as corporate events or weddings. The hotel is an easy walk to nearby corporate office buildings and the CBD transportation hub. Express, in-room dining is available as well as an Executive Lounge with stunning river views offering complimentary breakfast, afternoon tea, evening cocktails and soft drinks throughout the day. With over 4,000 square meters of flexible meeting space, Conrad Guangzhou can accommodate event groups ranging in size from intimate to up to 1,000 guests and offers state-of-the-art audiovisual technology including extra-large LED screens. A 24-hr business center offers a wide range of secretarial and administrative services. To ensure that guests enjoy all that the city has to offer by way of culture, art, cuisine and adventure, Conrad Guangzhou offers Conrad 1/3/5 , a signature program offering a curated collection of inspired experiences based on your preference for a 1, 3 or 5-hour itinerary. Conrad Guangzhou also offers Conrad Concierge, now available through the Hilton Honors app, which enables guests to customize the details of their stay, such as pre-selecting bath amenities, or checking-in while in transit, via a smartphone or tablet. Conrad Guangzhou participates in Hilton Honors®, the only hotel loyalty program that allows members to earn Points & Miles® on the same stay, with No Blackout Dates on reward stays. Along with Honors Points, members also enjoy the lowest rates, digital check-in, complimentary internet access, and a booking fee waiver when they book directly through www.conradhotels.com. Conrad Guangzhou is located at No. 222 Xingmin Road, Zhujiang New Town, Tianhe District, Guangzhou. 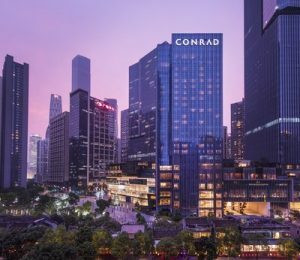 For more information or to make reservations, please call the hotel directly at +86 20 3739 2222, or visit the hotel’s website at www.conradguangzhou.conradhotels.com or follow the hotel on Wechat: Conradguangzhou. For more information about Conrad Hotels & Resorts, please visit news.conradhotels.com or follow usat www.facebook.com/ConradHotels, www.instagram.com/ConradHotels, twitter.com/ConradHotels.